Medford resident Jennifer Corallo has lived in town for 13 years and has had no negative experiences, until recently, when she received an angry note posted on her front door. Taking to Facebook, she shared the note and was greeted with a plethora of positivity from her local community. Monday, Oct. 31 was just another Halloween for Corallo. She left her house to walk her dogs around 5:30 p.m. with the yard lights on, but made sure to turn off her porch and back lights. Upon returning from the walk, she soon after went to bed. Feeling sad and alone, and knowing that someone nearby was so upset with her, she took to Facebook for support and posted a picturing of the note on the “Medford 08055” group page. What happened next came as a shock, as she was immediately flooded with positive comments and encouragement. She came home later to find a beautiful bouquet of flowers. 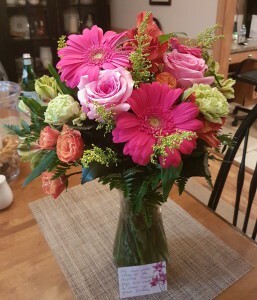 Her initial thought was that her husband sent them, since he was out of town for her birthday. 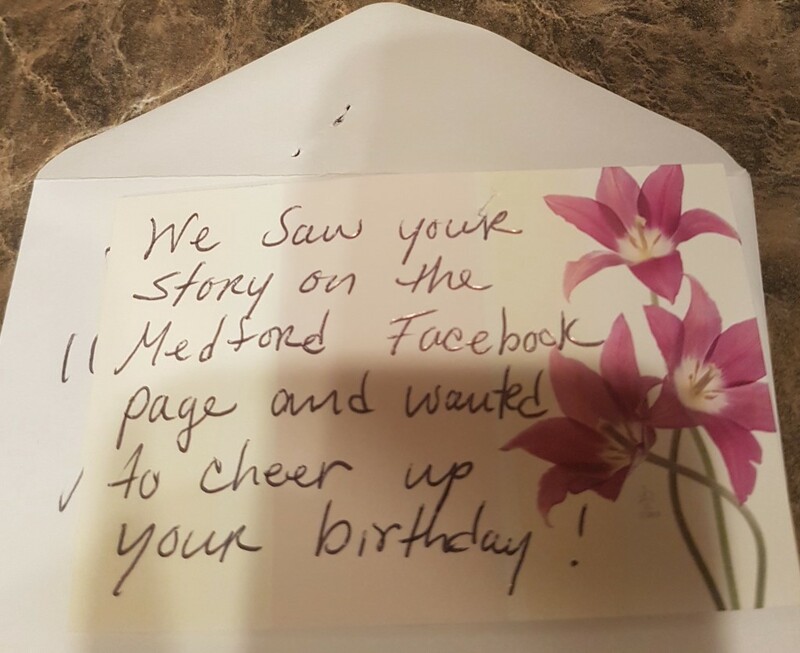 However, when she opened the card that was attached, she found a sincere note written from local people who saw her Facebook post and wanted to cheer her up. “I got so caught up with the flowers that I forgot to check the mail. I go out to get it before I turn in for the night and find a gift bag with a candle holder that has my name and a candle, a beautiful hand-written card and another card with a Starbucks gift card inside,” Corallo said. She added there had also been many people private messaging her on Facebook, including one Mary Kay consultant who said she wanted to give Corallo a pampering session and a free gift. “I am blown away by this community. I never imagined how so many strangers could make my birthday one of the best birthdays I’ve ever had. I am touched,” Corallo said. She explained how it speaks in volumes how people can simply reach out and make someone else’s day better. Although she didn’t resort to posting online out of sympathy, but rather shock, the community helped her to feel less alone on her first birthday as an empty-nester in years and while her husband was away. She said the strangers who reached out to her have made her feel more connected with the town in every way. “I am so thankful. I have no words to express my gratitude! I truly never expected such a response. I am overwhelmed and so very grateful for all the love and happiness you have given me on my special day. I wish all of you a beautiful, happy, healthy year, and please know all of you have a friend in me,” she posted in the Facebook group on Nov. 2.